In a world of fierce global competition and rapid technological change, traditional strategies for gaining market share and achieving efficiencies no longer yield the returns they once did. How can companies drive consumer preference and secure sustainable growth in this digital, social, and mobile age? The answer is through functional integration. Functional integration offers forward-looking brands a unique competitive edge by using transformative digital technologies to deliver high-value customer experiences, generate repeat business, and unlock lucrative new business-to-business revenue streams. 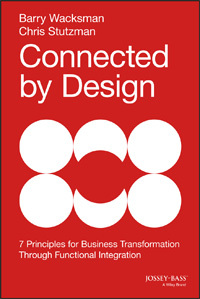 Read the Introduction, which highlights how Nike+ and Apple put the 7 Principles for Business Transformation Through Functional Integration to work for their business. AEF would like to thank the authors and Wiley for their permission to share this excerpt with aef.com users. To purchase this book, visit amazon.com. Copyright © 2014 Jossey-Bass, a Wiley Brand. All rights reserved.